How You Can Keep Your Golden Retriever Healthy, Happy and Obedient! Golden Retrievers are quick to learn and eager to please, patient, fun-loving, full of energy and easily trained. As you read further down this page you will begin to understand that as your Golden Retriever’s human companion you will undoubtedly be the center of its universe – and the chances are it will become the center of yours too. In ‘Golden Retrievers : Everything You Need to Know’ I cover everything you will need to know about taking care of, maintaining and training your Golden Retriever in one handy Guide which both current and future Golden owners will love! Potential Golden Retriever owners usually have various goals. Some want a reliable hunting partner, some a competitive show dog, and some just simply want a healthy and personable family pet. Regardless of what your goals may be regarding your dog, your first priority should be choosing one that is as healthy as possible. It’s not hard to find a Golden Retriever, but if you want a good one that represents the breed at its best, you need to choose your source carefully. These tornadoes in adorable, sweet, kissable, fuzzy little packages can take a happy, clean home and turn it into a house of horrors to rival the best carnival’s. From their tiny little knives of teeth to their complete lack of comprehension of the word “No,” puppies are trouble. Yet one look into that open, innocent little face and those big, loving eyes that consider you a god and you’re hooked. It’s an addiction, but there’s really no cure besides a good education in all things puppy-related. So put on that thinking cap, and grab your copy of ‘Golden Retrievers : Everything You Need to Know’ because you’ll need it when they get you in their furry clutches… and then breathe on you with that puppy breath! The three certifications you need from a good breeder. Your Golden Retriever’s performance, health, and longevity depend, in part on what you choose to feed him. Dogs’ diets can be as complex as ours, and it’s important to hit all of the vital nutritional bases. Lack of the proper vitamins and nutrients can lead to upset stomachs, skin problems, brittle bones, obesity, and even – in the worst cases – death. Proper nutrition is the building block of his overall health. Without the right nutrition and exercise, his defenses against disease and disorders are weakened. Because most dogs are usually fed one type of food, choosing the best diet is an important and often daunting decision. 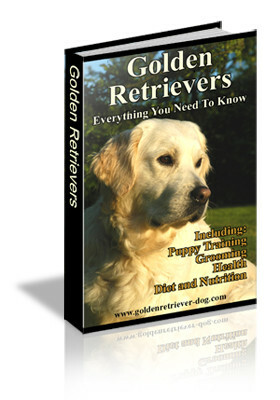 In ‘Golden Retrievers : Everything You Need to Know’ you will find out about commercial vs. home-prepared diets, commercial foods, canine nutrition, feeding & weight and eating related conditions. The right diet, exercise and care really make all the difference. When you get ‘Golden Retrievers : Everything You Need to Know’ you will also find details of conditions and illnesses that can crop up in the Golden Retriever breed. 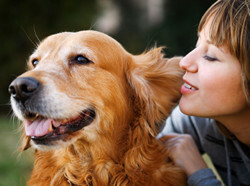 Early detection and prevention will help your golden live a longer, happier life. You will also learn the right way to groom your Golden. Grooming won’t only make your Golden look beautiful; it can also prevent serious health problems. Just as with people, good grooming involves more than an occasional brushing of the hair. Keeping the nails, teeth, eyes, and ears well groomed is just as important. In choosing to add a Golden Retriever to your family you are getting a great companion and friend. Imagine what it will be like to do things together like run along the beach, catch tennis balls, play in the park and hike in the mountains. To do these things, however, your Golden Retriever needs training. Many dog owners won’t admit their dog needs training. “He does everything I ask,” they say. Yet when asked specific questions about their dog’s behavior, the story changes. A trained dog is not going to jump on people, dash out the door each time it is opened, or raid the trash can. As a dog owner you can benefit from training, too. You will learn how to teach your dog, how to praise him, and how to motivate him to want to be good. You will also learn how to prevent problem behavior from happening and how to correct the mistakes that do occur. Dog training means teaching your Golden that he is living in your house, and not his. Training helps build a relationship between you and your Golden Retriever. This relationship is built on trust, affection, and mutual respect. Training can help your Golden become your best friend and a well-mannered companion who is a joy to spend time with. Dog training is much more than the traditional sit, down, stay, and come . Dog training means teaching your Golden that he is living in your house, and not his. It means that you can establish some household rules and that he is expected to follow those rules. It doesn’t mean that you will be turning him into a little robot, but it will cause your dog to look at you differently. Training isn’t something you do to your Golden, but rather something that the two of you do together. Just like older humans, dealing with older dogs carries with it a unique set of challenges, needs, and responsibilities. Just because your Golden doesn’t show you all of the effects of his increasing age doesn’t mean they’re not real. Goldens aim to please and would rather play than nurse a sore limb, so why would you think they’d make their pain in aging obvious? Many times, owners realize that their dogs are suffering from the effects of aging before the dogs themselves, particularly dogs that have a very playful, rambunctious nature. Your Golden doesn’t really have a concept of time (you will notice that he will be just as happy to see you after an hour apart as he is when you’ve been gone for a week), so he won’t understand what’s happening to his body. He may be confused about the pains he’s feeling, and he’ll be looking to you to help him deal with them. 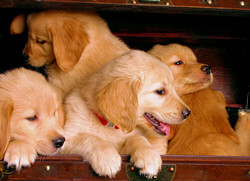 And that’s just a fraction of what you get with Golden Retrievers : Everything You Need to Know! You Get The Book PLUS The Audio Book! Downloadable Digital Book. You can be reading Golden Retrievers : Everything You Need To Know in as little as 2 minutes from right now (even if it’s 2am on a Sunday!). My automated system will deliver your copy as a downloadable PDF file (which can be read on any computer). You can read the book on your computer, or even print it out if you like. 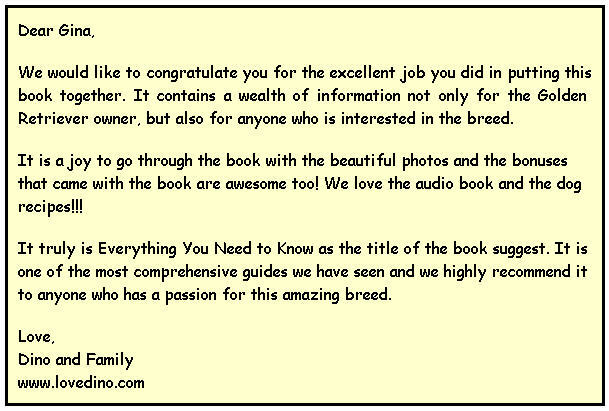 Downloadable Audio book. You’ll also get the Audio book version in MP3 format so you can download it straight away. You can listen to it on your iPod or other MP3 device, burn it to a CD, or just listen to it right on your computer. The choice is yours! OK – How Much Is This Going To Cost Me? You know the cost of audiobooks and specialist books can be high, but don’t worry, this golden retrievers package is not going to cost anywhere near as much as it should. The real question is: how much is it worth to have a happy, healthy and obedient golden retriever? Why risk making the mistakes so many other owners are making and paying for! Take advantage of the experience and knowledge I’ve put into this golden retrievers guide for just $37. Classic retriever training guide. An absolute gem of retriever puppy care and training. You can now get this digital reproduction of my own personal copy as a free bonus to Golden Retrievers : Everything You Need To know! Over 1 hour of Dog Training Tips and insights in mp3 audio format from expert trainer and behavioural consultant Howard Weinstein. Treat your best friend to some home-cooked treats (s)he’s sure to enjoy with these 130 delicious recipes! Wishing you and your Golden years of fun and happiness. P.S. Take advantage of the experience and knowledge I’ve put into this guide and find the answers, tricks and training techniques you need for your Golden Retriever. Click here and get instant access right now.